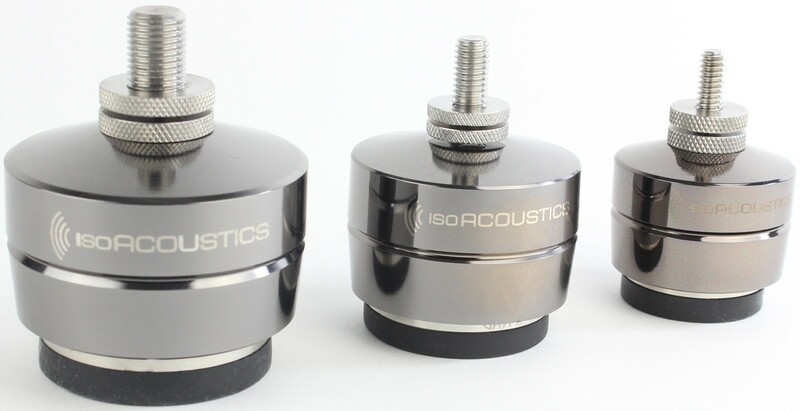 IsoAcoustics GAIA Isolation Pucks improve sound clarity and openness; available in small (up to 32kg), medium (up to 54kg) or this large model (up to 100kg). 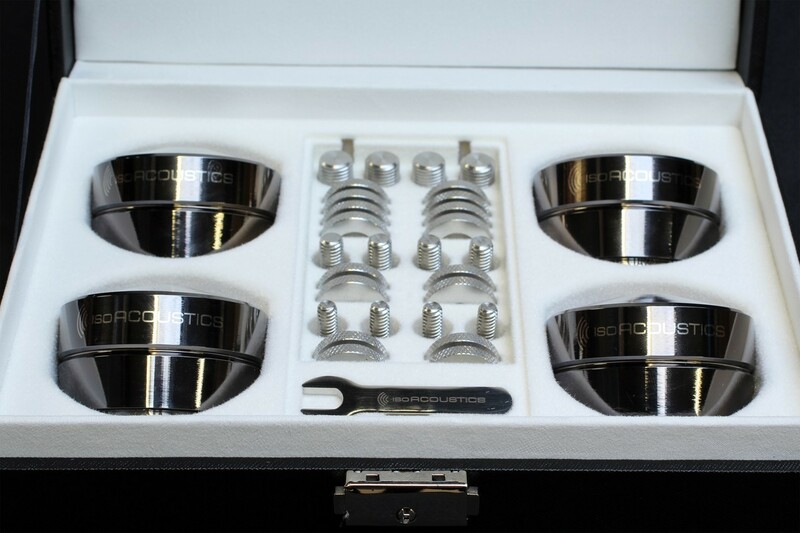 Earn 599 loyalty points when you order this item. - Dimensions (WH): 2.5" x 1.6"
- Dimensions (WH): 2" x 1.4"
- Dimensions (WH): 1.7" x 1.2"
IsoAcoustics GAIA Isolation Pucks, supplied in packs of 4, are made for floor standing speakers with the aim to deliver excellent acoustic performances and best possible sound clarity every time. 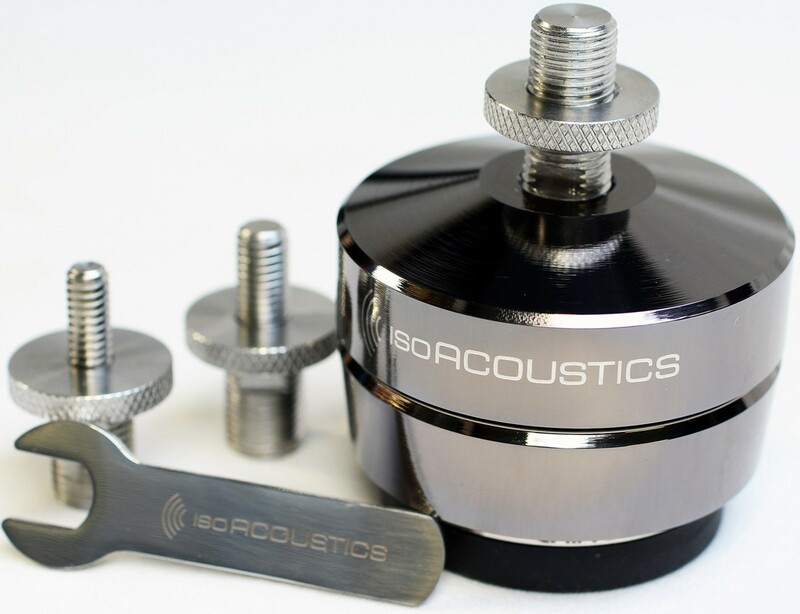 IsoAcoustics recommends users install the isolators with the logo facing your listening area or that they are rotated 180 degrees which would align the isolators with the speaker’s motive forces. 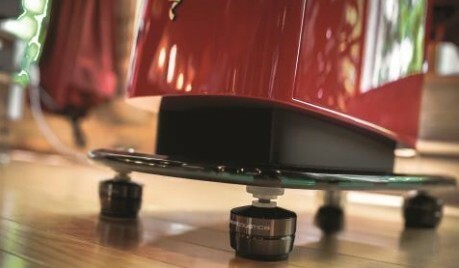 This results in a soundstage that unveils a three-dimensional image of realistic, spatial sound. 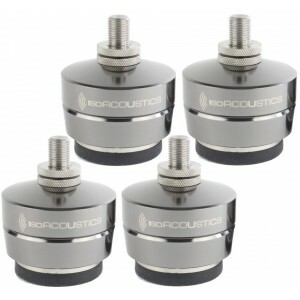 The dark chrome machined housing brings together premium acoustic engineering and stunning aesthetics. Internal reflections from the hard supporting surface are attenuated resulting in greater sound clarity and openness than you’ve ever heard from your speakers. 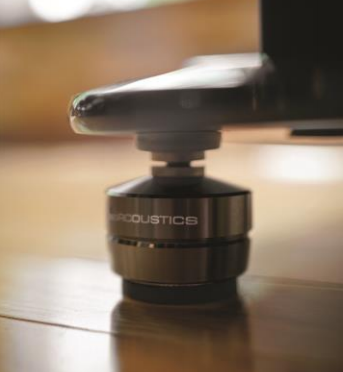 The IsoAcoustics GAIA isolation pucks use a trademarked design to produce incredible results with a high degree of isolation as well as reduced lateral movement and oscillations to preserve alignment with the listening position. The B&W plate adapts the GAIA I to the Bowers & Wilkins Nautilus and Diamond series speakers. The ball casters are removed and replaced with the B&W plate, which provides a threaded hole for the appropriate stud to screw into. Designed to maintain stable support on carpet, the optional Carpet Spikes work with the GAIA I isolators to provide improved performance with thicker pile and carpet under pads.